"Kayla took the absolute best care of us! This was our first time buying a home and she took all the stress away. She was in our corner and made sure we had everything we needed. Kayla kept us updated on change and explained anything we didn't understand (which was a lot because we were new to the process). I will use her again in the future and highly recommend her to anyone looking to purchase a new home or property. Thanks again Kayla!!!" "Working with Kayla on the sale of my Kings Valley house was a pleasure from start to finish. She was responsive, kept me updated and talked me through all my options. Even when the original buyers fell through, through no fault of her own, Kayla was always positive and helpful. She quickly found me a more suitable buyer that I truly couldn't be happier with. The whole process was as stress free as I could expect and I am happy to recommend Kayla to anyone looking to buy or sell in the mountains!" "We purchased our home almost completely remotely. It was such a smooth and easy process. She was able to help us find the inspectors we needed, even though the home was in a fairly rural area. I would definitely recommend her to friends and family!" "Kayla really listened to what we wanted and got us to those places without wasting our time on those that didn't. What an invaluable resource! She understood our needs, and our schedule, and had a smile each time we met. She represented us well with the home seller and got us everything we needed to complete the deal. What more could anyone ask for??" "We walked into the Re/Max Conifer office and we were lucky enough to be greeted by Kayla. Kayla assisted us in finding what we needed despite our constant changes and requirements. Kayla was patient through the whole process." "She is very Through And pays attention to detail on contracts I liked very much that I could send her homes I had found on my own and she would get all the info for me." "kayla was so great to have work for me she hung in there and put up with me threw all my personal problems she sold my house so fast for more then i was asking then worked beyond what any realtor ever had before to get me in another home she was there for me everyday and never gave up even when I was ready to she put me in the home I wanted for the price I wanted in the neighborhood I wanted unbelievable worth her weight in gold a true friend I recommended her to anyone and have I'll definitely use her again if needed." "Kayla knows the "foothills" as well as anyone and really displayed her local knowledge during our buying process. My wife and I moved here from the east coast and Kayla was instrumental in choosing area(s) which would meet our living wants while keeping our work commute to a minimum. We highly recommend Kayla!!!!" "Kayla has a well established, very professional system for marketing a home. She confidently brought all resources together to sell my home quickly and relatively painlessly. She helped me work out issues with various entities like the septic company and Jefferson County that would have otherwise caused me distress. I will recommend her to friends, and contact her again when I need an agent." 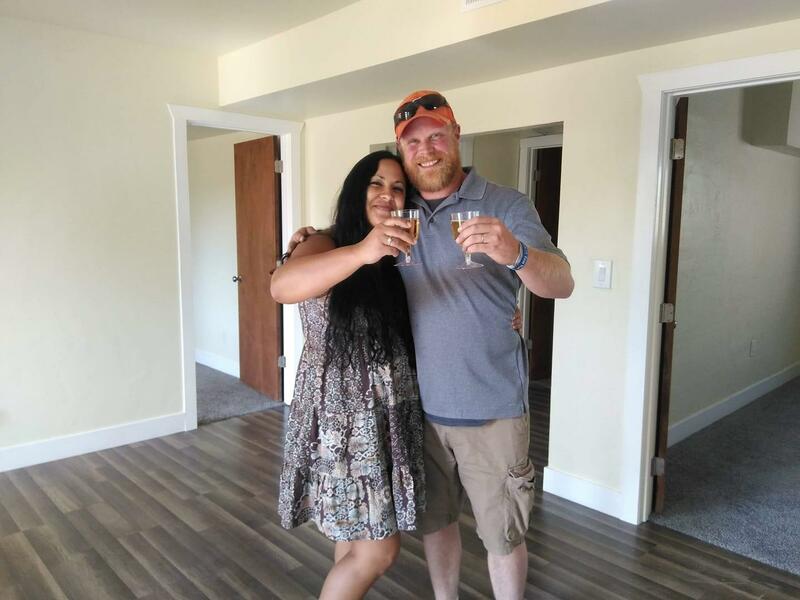 "Kayla did a great job finding Me and Aaron our first home! We love our house!" "We recommend Kayla because she is a smart, caring, hard working woman who really listened to us. I dragged her up and down 285 for months until the perfect home came around. When we decide to sell there is noone else we would even think about helping us." "I’ve known Kayla since she helped me buy my house in Lakewood 5 years ago. She has since helped me sell that house and buy a new one. I fully recommend her service above all others." "I would highly recommend Kayla as a realtor. Our search led us from raw land on the outskirts of town, to the innards of Denver. We were quite picky, value aware, and always had 2 active young boys with us. Kayla patiently dealt with our differing wants/needs/"like to have", while we honed in on the area that fit our needs. Our large list of "must haves" made a difficult challenge, but she held firm on the search and was always professional, and a pleasure to work with. She even found that our boys loved her young German Shepherd, and brought him along to make sure they enjoyed the experience. I have very high professional standards for the people I work with - Kayla met them all." "Kayla was very professional. Any questions I had she answered and then some. She was very upfront and told us what to expect. She was always on top of what was needed. Her honesty is second to none, even if it was bad news. She lead the charge when it came to purchasing our new home. Amazing work. Thank you!!" "Very professional and she was great to work with. She got the job done. I recommend her to sell your home or help in the purchase. She did both for us." "Kayla was a "God-send" to me! It was necessary for me to close and clear a friend's estate in Colorado and I live in Michigan. I found Kayla while I was there attempting to clear up his home and get it ready for sale. Kayla took matters into her own hands, securing the right people for a clean-up and estate sale, someone to find he well head and check out the septic tank and field. She did so much leg work for me and was always willing to assist with my many and varied requests. She did a wonderful job in listing the home and taking wonderful pictures. The property sold the first weekend it got listed after having he estate sale and was shown almost 50 times and finally got over 10 offers! I wish I had more properties to sell and give to her. I have already recommended her to others in same position as myself." "From start to finish, Kayla was always very helpful and friendly! She met all of our requests to view any house or condo - even if they were on some back roads :) If we found a home that we wanted to look at it, Kayla was very responsive on setting up a time right away. With the fast Colorado market Kayla was always on top of her game. As a first time home buyer, any concerns or questions were quickly answered or Kayla would follow up with us in a timely manner. We would recommend her to any home buyer!" "Kayla did a wonderful job locating homes that fit my needs and was very good during the contract process and inspection. She previewed homes for me while I was working in order to save time on the weekends, which was extremely helpful and allowed us to eliminate properties that didn't fit my criteria." "Kayla was very helpful in helping us find our new home and a property that was perfectly in tune with what we were looking for. Kayla showed us a selection of homes over a few days of snowstorms and her positive attitude helped us through the stress of trying to find the "perfect home" in what was a fairly tight market. We would recommended Kayla to anyone who wants not only professionalism and knowledge from their realtor but also energy, attitude and a totally positive experience. Kayla truly helped us begin the next chapter of our life! " "Ms. Kayla Morris suggested a strategy for selling my house that was successful in creating lots of buyer interest. With her help my house sold for more than I expected. She helped with all of the details and even oversaw some of the repairs. She made all of this possible for me, while I was living in Baltimore Maryland. I highly recommend her for any real estate transactions you might be considering." "As I’ve aged I have come to appreciate someone with Kayla’s tenacity and perseverance. Her age hides the fact that this young lady knows her business and knows the area in which we now call home. I will gladly pass on Kayla’s information to anyone interested in purchasing a home or property." "Kayla was very helpful with suggestions of how to stage the house and what the range for the asking price should be. She kept us well informed of what we should expect, explaining to us what was happening at the various stages, and answering all questions in a timely and appropriate manner. Our family will certainly use Kayla again, if the need arises." "On top of every detail. Very responsive to questions and concerns. Able to articulate and give accurate advice on each step of the process. An absolute asset in the real estate process whether you are buying or selling." "My husband and I moved here from out of state last year and didn't know a soul in town. Kayla took us under her wing and was very patient and informative with all of our questions we had about the real estate and area we were looking to move to. We only had a week to review and visit homes since our house had sold and was in escrow and we were visiting in hopes to find a house in the short time we had. Kayla was very diligent in her research and really listened to what we were looking for in order to find us the absolute perfect home to fit our needs. I highly recommend Kayla if you are looking to purchase or sell your home. Buying/Selling a home can be a tedious and often scary process. Kayla truly goes above and beyond to make the process smooth and pain free as possible." "Kayla sold our home within the first week of listing with her. She was very knowledgeable about the importance of marketing; social media, flyers, etc. She was easy to work with, professional, responsive. We enjoyed working with her and would do it again." "Kayla is phenomenal, we found our perfect home thanks to her. We looked in multiple parts of the Centennial, Denver, Lakewood and Littleton areas and Kayla was happy to show us the houses everywhere we requested. Kayla definitely went above and beyond for us and we couldn't be more grateful!" "Kayla has a lot of knowledge and drive. Home buying can be a stressful time for anyone but Kayla was able to make it a very positive and exciting time for me. She really took time listen to my needs and followed through on them. When it was time to go under contract her knowledge and negotiating skills made it possible for me to get the home I really loved. I would definitely recommend her to family and friends and reach out to her for any future needs." "Kayla Maathuis was excellent! She was very knowledgeable and patient with us through the entire process helping us buy our first home. She showed us countless homes and helped find the best home for us. I would definitely recommend her for any real estate purchase." "Kayla brought me full price offers and we closed within 30 days! She is very responsive and knowledgeable and worked hard to get all deadlines met. She also met me on her day off, showed me a property and I had keys in my hands 10 days later. I highly recommend her." "Seriously, if any of you are looking for a home out this way, absolutely contact Kayla Maathuis. She spent months and months patiently showing properties to the pickiest person I know. And of course found the perfect home for him too! Bamboo still going strong too!"